You see a map that contains territory of Germany. Displayed huge city Hamburg presented. large city Hannover for Garmin. On this map city Wandsbek free download. You can find here city Marienthal presented. Displayed city Eimsbuettel for Garmin. Displayed city Altona marked. city Braunschweig marked. Displayed city Magdeburg download for free. On this map city Neue Neustadt for Garmin. On this map city Luebeck marked. You can find here city Harburg marked. city Wolfsburg presented. On this map city Bergedorf marked. You can find here city Hildesheim free download. 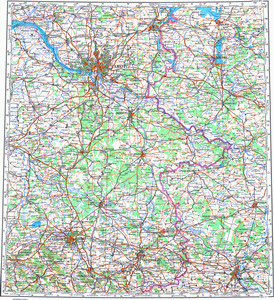 On this map city Schwerin free download. On this map city Norderstedt free download. You can find here city Luneburg for Garmin.